With the increasingly available sequences of many eukaryotic genomes, technologies for genome editing have become the most promising and popular tools for scientists to understand such complex genomes and precisely and quickly manipulate them for good. Genome editing technologies, including zinc figure nucleases (ZFNs), TAL effector nucleases (TALENs), and clustered regularly interspaced short palindromic repeats (CRISPR)/CRISPR-associated proteins (CRISPR/Cas), allow precise, targeted genomic changes. TALENs and CRISPR/Cas represent the state-of-the-art genome editing technologies and hold immense promise for defining the genetic and molecular basis for valuable traits, as well as for the introgression of valuable genes/traits into cultivated varieties in a timely and economically sound manner. For the past several years, my lab has been working on both TALENs and CRISPR/Cas for a better understanding of how they work in different plant cells and for their applicability to basic and applied plant biology. I.1 Develop and utilize CRISPR based genome editing in rice and other plants. With expertise in genome editing with TALENs, we quickly expanded our genome editing work to CRISPR/Cas mediated technologies for targeted mutagenesis and gene replacement in rice, maize, wheat, sorghum, soybean, yam, and switchgrass, either by ourselves or through collaboration with other labs. Briefly, we have established a highly efficient rice CRISPR system, a high-efficiency maize CRISPR system and an efficient switchgrass CRISPR system; we are also in the process to build and optimize CRISPR systems for wheat, sorghum, soybean and yam with the support from our current grants. I.2 Broader impacts. Much of my time and effort has been spent to advocate the genome editing technologies in scientific community. I have been giving seminars of different settings to talk about our genome editing work, make the biological materials available to any academic lab who is interested in using our systems, organize and participate in genome editing workshops to train participants, and make use of our expertise and systems more efficient through close collaboration with many labs on- and off-campus. Rice is an important stable crop that provides food for more than half of the world’s population, while bacterial blight, caused by the pathogenic bacterial strains of Xanthomonas oryzae pv. oryzae (Xoo) in rice, is one of the most devastating rice diseases, often resulting in yield losses of up to 50% and sometimes destroying the entire crop. The disease represents one of the most well-studied crop diseases and is also well-known as a model for studying host/microbe interaction. TALEs (transcription activator-like effectors), as a group of pathogenesis factors and once translocated into the host cells from pathogens, recognize and activate host genes to condition disease susceptibility and also trigger host resistance responses dependent on the nature of target genes in plants. TALEs and their target genes have become the foci of the molecular battles between Xoo and rice. The continuing battles have led to incredibly diverse virulence mechanisms in pathogen and counteracting defense mechanisms in rice. Extensive effort in my lab has been made to understand the TALE biology, identify host target genes, and elucidate their interaction and resulting physiological relevance to rice blight. 1. Zhengzhi Zhang, Lei Hua, Ajay Gupta, David Tricoli, Keith J. Edwards, *Bing Yang and *Wanlong Li 2019 Development of an Agrobacterium-delivered CRISPR/Cas9 system for wheat genome editing. Plant Biotechnology Journal, doi: 10.1111/pbi.13088. 2. Imtiyaz Khanday, Debra Skinner, Bing Yang, Raphael Mercier and *Vankastesan Sundaresan 2019 A male-expressed rice embryogenic trigger redirected for asextual propagation through seeds. Nature 565:91-95. 3. Shan S., Mavrodiev E. V., Li R., Zhang Z., Hauser B. A., *Soltis P. S., *Soltis D. E., and *Yang B. 2018 Application of CRISPR/Cas9 to Tragopogon (Asteraceae), an evolutionary model for the study of polyploidy. Molecular Ecology Resources 18(6): 1427-1443. 4. Yang Liu, Paul Merrick, Zhengzhi Zhang, Chonghui Ji, *Bing Yang, *Shui-zhang Fei 2017 Targeted mutagenesis in tetraploid switchgrass (Panicum virgatum L.) using CRISPR/Cas9. Plant Biotechnology Journal 16(2):381-393. 5. Si Nian Char, Anjanasree K. Neelakandan, Hartinio Nahampun, Bronwyn Frame, Marcy Main, Martin H. Spalding, Philip W. Becraft, Blake C. Meyers, Virginia Walbot, *Kan Wang, *Bing Yang 2016 An Agrobacterium-delivered CRISPR/Cas9 system for high-frequency targeted mutagenesis in maize. Plant Biotechnology Journal 15(2):257-268. 6. Ting Li, Bo Liu, Chih Ying Chen, *Bing Yang 2016 TALEN-mediated homologous recombination produces site-directed DNA base change and herbicide-resistant rice. Journal of Genetics and Genomics 43(5): 297-305. 7. Si Nian Char, Erica Unger-Wallace, Bronwyn Frame, Sarah A. Briggs, Marcy Main, Martin H. Spalding, Erik Vollbrecht, Kan Wang and *Bing Yang 2015 Heritable site-specific gene mutagenesis using TALENs in maize. Plant Biotechnology Journal 13(7):1002-1010. 8. Brazelton, V.A. Jr., Zarecor, S., Wright, D.A., Wang, Y., Liu, J., Chen, K., Bing Yang and *Lawrence-Dill, C.J. 2016 A quick guide to CRISPR sgRNA design tools. GM Crops & Food 6(4):266-276. 9. Huanbin Zhou, Bo Liu, Donald Weeks, Marty Spalding and *Bing Yang 2014 Large chromosomal deletions and heritable small genetic changes induced by CRISPR/Cas9 in rice. Nucleic Acids Research 42, 10903-10914. 10. Ting Li, Bo Liu, Chih Ying Chen, *Bing Yang 2014 TALEN utilization in rice genome modifications. Methods 69, 9-19. 11. Wenzhi Jiang, Bing Yang and *Donald Weeks 2014 Efficient CRISPR/Cas9-mediated gene editing in Arabidopsis thaliana and inheritance of modified genes in T2 and T3 generations. PloS One 9:e99225. 12. Wenzhi Jiang, Huanbin Zhou, Honghao Bi, Michael Fromm, Bing Yang, *Donald Weeks 2013 Demonstration of CRISPR/Cas9/sgRNA-mediated targeted gene modification in Arabidopsis, tobacco, sorghum and rice. Nucleic Acids Research 41(20): e188. 15. *Jeffrey D Wolt, Bing Yang, Kan Wang, Martin H Spalding 2016 Regulatory aspects of genome-edited crops. In Vitro Cellular & Developmental Biology-Plant 52(4):349-353. 16. Donald P Weeks, Martin H Spalding, *Bing Yang 2016 Use of designer nucleases for targeted gene and genome editing in plants. Plant Biotechnology Journal 14, 483-495. 17. *Jeffrey D Wolt, Kan Wang, Bing Yang 2016 The Regulatory Status of Genome-edited Crops. Plant Biotechnology Journal 14, 510-518. 18. David Wright, Ting Li, *Bing Yang and *Martin H. Spalding 2014. TALEN-mediated genome editing: prospects and perspectives. Biochemistry Journal 462, 15-24. 19. Ting Li and *Bing Yang 2013 TAL effector nuclease (TALEN) engineering, pp.63-72, in Enzyme Engineering: Methods and Protocol, Edited by James C. Samuelson, Humana Press. 20. Ting Li, Bo Liu, Martin H. Spalding, Donald Weeks and *Bing Yang 2012 High efficiency TALEN-based gene editing produces disease resistant rice. Nature Biotechnology 30, 390-392. 21. Ting Li, Sheng Huang, Xuefeng Zhao, David Wright, Susan Carpenter, Martin H. Spalding, Donald Weeks and *Bing Yang 2011 The modularly assembled designer TAL effector nucleases for targeted gene knockout and gene replacement in eukaryotes. Nucleic Acids Research 39, 6315-6325. 22. Ting Li, Sheng Huang, Wenzhi Jiang, David Wright, Martin H. Spalding, Donald P. Weeks, *Bing Yang 2010 TAL nucleases (TALNs): hybrid proteins composed of TAL effectors and FokI DNA-cleavage domain. Nucleic Acids Research 39, 359-372. 1. Juying Long, Congfeng Song, Fang Yan, Junhui Zhou, *Huanbin Zhou and *Bing Yang 2018 Non-TAL effector from Xanthomonas oryzae pv. oryzae suppress peptidoglycan-triggered MAPK activation in rice. Frontiers in Plant Science 9, 1857. 2. Jungil Yang, Dangping Luo, Bing Yang, *Wolf Frommer and *Joon-Seob Eom 2018 SWEET11 and 15 as key players in seed filling in rice. New Phytologists 218(2), 604-615. 3. Margaret Bezrutczyk, Thomas Hartwig, Marc Horshman, Si Nian Char, Jinliang Yang, Bing Yang, *Wolf Frommer and Davide Sosso 2018 Impared phloem loading in zmsweet13a,b,c sucrose transporter triple knock-out mutants in Zea mays. New Phytologists 218(2), 594-603. 4. Zhiyuan Ji, Chonghui Ji, Bo Liu, Lifang Zou, *Gongyou Chen, *Bing Yang 2016 Interfering TAL effectors of Xanthomonas oryzae neutralize R-gene-mediated plant disease resistance. Nature Communications 7, 13435. 5. Sheng Huang, Ginny Antony, Ting Li, Bo Liu, Ken Obasa, *Bing Yang, *Frank F White 2016 The broad recessive resistance gene xa5 of rice is a virulence effector-dependent quantitative trait for bacterial blight. Plant Journal 86(2), 186-194. 6. Davide Sosso, Dangping Luo, Qin-Bao Li, Joelle Sasse, Jinliang Yang, Ghislaine Gendrot, Masaharu Suzuki, Karen E Koch, Donald R McCarty, Prem S Chourey, Peter M Rogowsky, Jeffrey Ross-Ibarra, Bing Yang, *Wolf B Frommer 2015 Seed filling in domesticated maize and rice depends on SWEET-mediated hexose transport. Nature Genetics 47, 1489-1493. 7. Junhui Zhou, Zhao Peng, Juying Long, Davide Sosso, Bo Liu, Joon-Seob Eom, †Sheng Huang, Sanzhen Liu, Casiana Vera Cruz, Wolf B. Frommer, Frank F. White, *Bing Yang 2105 Gene targeting by the TAL effector PthXo2 reveals cryptic resistance gene for bacterial blight of rice. Plant Journal 82(4), 632-643. 8. Adam T Klein, Gargey B Yagnik, Jessica D Hohenstein, Zhiyuan Ji, Jiachen Zi, Malinda D Reichert, Gustavo C MacIntosh, Bing Yang, Reuben J Peters, Javier Vela, *Young Jin Lee 2015 Investigation of the Chemical Interface in the Soybean–Aphid and Rice–Bacteria Interactions Using MALDI-Mass Spectrometry Imaging. Analytical Chemistry 87 (10), 5294–5301. 9. Chunlian Wang, Xiaoping Zhang, Yinglun Fan, Ying Gao, Qinlong Zhu, Chongke Zheng, Tengfei Qin, Yanqiang Li, Jinying Che, Mingwei Zhang, Bing Yang, Yaoguang Liu, *Kaijun Zhao 2015 XA23 is an executor R protein and confers broad-spectrum disease resistance in rice. Molecular Plant 8(2), 290-302. 10. Chun-Lian Wang, Teng-Fei Qin, Hong-man Yu, Xiao-Ping Zhang, Jin-Ying Che, Ying Gao, Chong-Ke Zheng, *Bing Yang and *Kai-Jun Zhao 2014 The broad bacterial blight resistance of rice line CBB23 is triggered by a novel transcription activator-like (TAL) effector of Xanthomonas oryzae pv. oryzae. Molecular Plant Pathology 15(4), 333-341. 11. Raul A. Cernadas, Erin L. Doyle, David O. Niño-Liu, Katherine E. Wilkins, Timothy Bancroft, Li Wang, Clarice L. Schmidt, Rico Caldo, Bing Yang, Frank F. White, Dan Nettleton, Roger P. Wise, *Adam J. Bogdanove 2014 Code-assisted discovery of TAL effector targets in bacterial leaf streak of rice reveals contrast with bacterial blight and a novel susceptibility gene. PLOS Pathogen e1003972. 12. Yang Hu, Junli Zhang, Hongge Jia, Davide Sosso, Ting Li, Wolf B. Frommer, Bing Yang, Frank F. White, Nian Wang, *Jeffrey B. Jones 2014 Lateral Organ Boundaries 1 is a disease susceptibility gene for citrus bacterial canker disease. Proc. Natl. Acad. Sci. USA. 111(4), E521-529. 13. Jixian Zhai, Yuanyuan Zhao, Stacey A. Simon, Sheng Huang, Katherine Petsch, Siwaret Arikit, Manoj Pillay, Lijuan Ji, Meng Xie, Xiaofeng Cao, Bing Yu, Marja Timmermans, Bing Yang, Xuemei Chen, and Blake Meyers 2013 Plant microRNAs display differential 3′ truncation and tailing modifications that are ARGONAUTE1 dependent and conserved across species. Plant Cell 25(7), 2417-2428. 14. Margaret Bezrutczyk, Jungil Yang, Joon-Seob Eom, Matthew Prior, Davide Sosso, Thomas Hartwig, Boris Szurek, Richardo Oliva, Casiana Vera-Cruz, Frank White, Bing Yang and Wolf Frommer, 2017 Sugar flux and signaling in plant-microbe interactions. The Plant Journal 93(4), 675-685. 15. 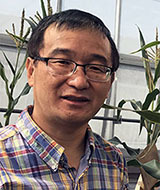 Wanlong Li, Bing Yang 2017 Translational genomics of grain size regulation in wheat. Theoretical and Applied Genetics. Doi: 10.1007/s00122-017-2953-x. 17. Si Nian Char, Sangryeol Park, *Bing Yang 2017 Interaction of rice and Xanthomonas TAL effectors, in press, in Rice Genomics, Genetics and Breeding, Edited by Takuji Sasaki and Moto Ashikari, published by Springer-Nature. 18. *Bing Yang and Frank White 2015 Transcription activation-like effectors: from pathogenesis to targeted genome editing, pp. 149-159, in Virulence Mechanisms of Plant-Pathogenic Bacteria, Edited by Nian Wang et al., published by the American Phytopathological Society Press, St. Paul, Minnesota. 19. *Bing Yang and Adam Bogdanove 2014 Inoculation and scoring methods for bacterial blight and bacterial leaf streak of rice, pp.249-255, in Rice Protocol, Edited by Yinong Yang, Humana Press. 20. Ginny Antony, Junhui Zhou, Sheng Huang, Ting Li, Bo Liu, Frank White, *Bing Yang 2010. Rice xa13 recessive resistance to bacterial blight is defeated by induction of the disease susceptibility gene Os-11N3. Plant Cell 22, 3864-3876. 21. Congfeng Song and *Bing Yang 2010 Mutagenesis of 18 Type III Effectors Reveals Virulence Function of XopZPXO99 in Xanthomonas oryzae pv. oryzae. Molecular Plant-Microbe Interactions 23, 893-902. 22. *Frank White and Bing Yang 2009 Host and pathogen factors controlling the rice-Xanthomonas oryzae interaction. Plant Physiology 150, 1677-1686. 23. Sugio, A, Yang, B., Zhu, T, and *White, FF. 2007. Two type III effector genes of Xanthomonas oryzae pv. oryzae control the induction of the host genes OsTFIIA1 and OsTFX1 during bacterial blight of rice. Proc. Natl. Acad. Sci. USA. 104, 10720-10725. 24. Yang, B., A. Sugio, and * White FF. 2006. Os8N3 is a host disease susceptibility gene for bacterial blight of rice. Proc. Natl. Acad. Sci. USA. 103, 10503-10508. 25. Gu, K, Yang, B. (co-first author), D Tian, L Wu, D Wang, C Sreekala, F Yang, Z Chu, G-L Wang, FF White, *Z Yin. 2005. R gene expression induced by a type-III effector triggers disease resistance in rice. Nature 435, 1122-1125. 26. Sugio, A, Yang, B, *FF White. 2005. Characterization of the hrpF pathogenicity peninsula of Xanthomonas oryzae pv. oryzae. Molecular Plant-Microbe Interactions 18, 546-554. 27. Yang, B, A Sugio, *FF White. 2005. Avoidance of host recognition by alterations in the repetitive and C-terminal regions of AvrXa7, a type III effector of Xanthomonas oryzae pv. oryzae. Molecular Plant-Microbe Interactions 18, 142-149. 28. Yang, B. White. FF. 2004. Diverse members of AvrBs3/PthA family of type III effectors are major virulence determinants in bacterial blight of rice. Molecular Plant-Microbe Interactions 17, 1192-1200. 29. Yang, B, W Zhu, LB Johnson and FF White. 2000. The virulence factor AvrXa7 of Xanthomonas oryzae pv. oryzae is a type III secretion pathway-dependent nuclear-localized double-stranded DNA-binding protein. Proc. Natl. Acad. Sci. USA 97, 9807-9812. 30. *White, F, Yang, B and LB Johnson. 2000. Prospects for avirulence gene function. Current Opinion of Plant Biology 3, 291-298.